Chances are, if you’ve ever worked in an office – or any kind of 9-to-5 job – you’ve also fantasized occasionally about getting out. After a grueling day of dealing with unreasonable customers, unpaid bills, pointless meetings, and a grumpy boss banging on your door to demand the report you haven’t had a single minute to work on, those Internet ads promising “$6,000 a month working from home” can start to look awfully tempting. The bad news is, most of those ads promising big bucks for freelance work are bogus. The good news is, there are legitimate jobs out there that really do allow you to earn a living by working from home. Take me, for instance: for the last 11 years, I haven’t set foot in an office. Instead, I work as a freelance writer, in the comfort of my own home, choosing my own hours for work and play. But while being your own boss sounds great, I can tell you firsthand that it’s not all sunshine and lollipops. Yes, it has definite perks, but it has some serious drawbacks too – and for many people, the cons are likely to outweigh the pros. But if you have the right temperament for it, you can make money working from home – and enjoy a happier, more satisfying life. Finding a legitimate work-from-home job isn’t easy. You can’t simply Google “work from home,” because a lot of the “jobs” you find this way are really scams. In fact, the Federal Trade Commission (FTC) warns that offers to start your own Internet business, stuff envelopes, assemble products at home, work as a mystery shopper, or sell products through a multi-level marketing plan are usually fake – and even the ones that are legitimate often don’t pay as much as they claim. Writing and Editing. I’ve worked as a freelance writer and editor for a wide variety of clients, from textbook publishers, to magazines, to websites. How much you earn at this job depends on how fast you work, as many clients pay by the piece or by the word, rather than by the hour. However, Kiplinger estimates that an Internet content writer can make about $18 per hour on average. Many clients look for writers and editors with a college degree, but others don’t care as long as you can write well. Translation. If you speak a foreign language, you can earn around $24 per hour translating business documents, websites, or scholarly papers. Chinese and Japanese speakers are in particular demand. However, many employers require either a college degree or previous translating experience (or both). Graphic Design. Like writers, graphic designers can work for many types of clients, designing everything from banner ads, to illustrations for children’s toys. This job generally requires a bachelor’s degree in graphic design. 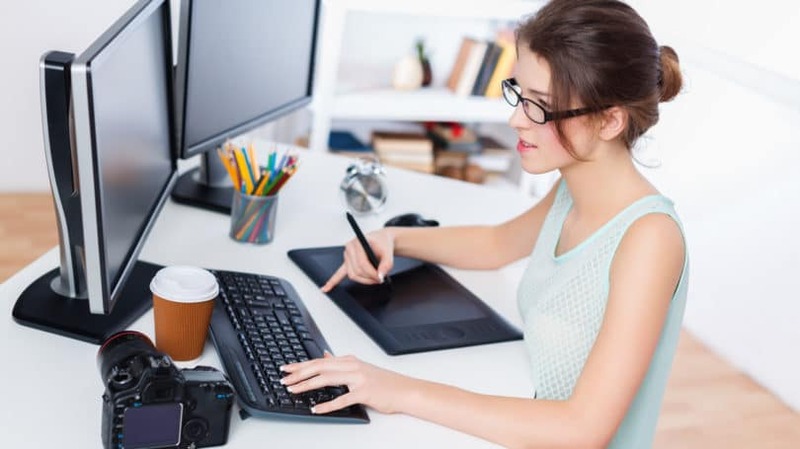 According to Forbes, freelance graphic designers earn an average of $890 per week, which works out to a little over $22 per hour for a 40-hour workweek. Marketing. The field of marketing covers a wide variety of topics: search engine optimization (SEO), social media, public relations, and advertising. The amount you can earn doing marketing work from home depends on your particular specialty. For instance, public relations specialists make about $28 per hour, generally requiring a bachelor’s degree in a field such as journalism, business, or communications. Customer Service. Although many customer service reps work out of call centers in India or elsewhere abroad, some companies hire U.S. workers to answer their customers’ questions, help with orders, and maintain accounts. Anyone with a high-school diploma can do this job, as employers provide all the necessary training. However, the pay is only around $10 per hour. Online Tutoring. Unlike old-fashioned tutors, who give lessons in students’ homes, web-based tutors meet with students online to give one-on-one assistance. If you have a college degree, you can pick up around $15 per hour tutoring students in your field. Medical Transcription. A medical transcriptionist takes a set of notes dictated by a doctor, types them up, and uses them to write memos and reports. This job requires training – either an associates’ degree or a certification that takes about a year to complete – and a detailed knowledge of medical terms. Certified medical transcriptionists can make about $17 per hour working from home, and can also earn benefits. Software Development. Although many software developers work full-time for one company, it’s a job you can do from home as long as you have the proper computing equipment. A degree in computer science is usually required, and the pay rate is about $38 per hour. Technical Support. If you have an associate’s or bachelor’s degree in computer science, you can get a job working from home to help businesses with their computer problems. This work includes testing computer networks and providing help to individual users. The pay is good – around $24 per hour – though probably not as much as you could make writing code. Web Development. Although many companies have full-time staff to design and maintain their websites, about one out of four web developers is self-employed. This job requires only an associates’ degree, and it pays around $33 per hour. Some career websites focus specifically on freelance and work-at-home jobs. Examples include Flexjobs, Freelancer, Guru, and Upwork (formerly known as oDesk). 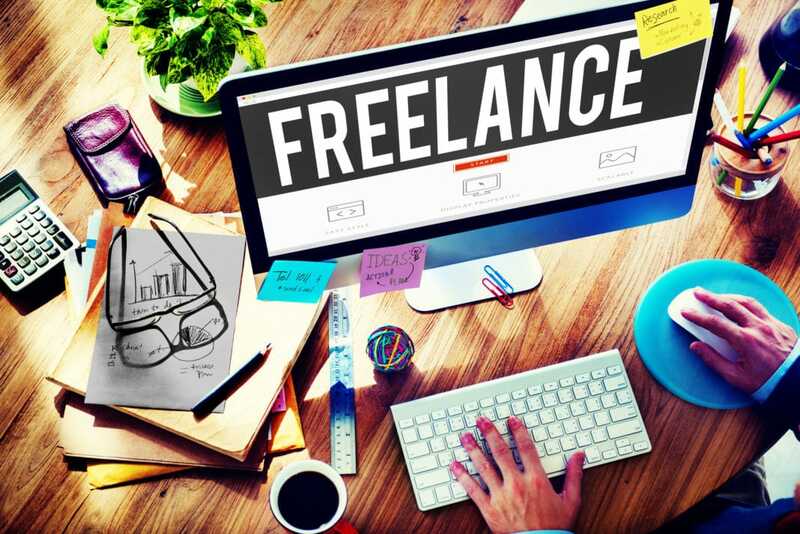 To find work specifically in media-related fields, you can search the freelance marketplace on Mediabistro, as well as the job postings at FreelanceWriting.com. For jobs in engineering and design, try the Canadian site Cad Crowd. The greatest benefit of freelance work is the freedom. When you work for yourself, you decide when you will work, and how, and where. Set Your Schedule. If you’ve never been a morning person, you no longer have to set an alarm clock – you can start your day at noon if you’d like and work later into the evening. If you finish your work for the day by 3pm, you can just knock off early instead of having to sit at your desk for another two hours trying to look busy. And if you need to take time off during the day to see your doctor or go to your kid’s school play, you can just do it without having to get permission from anyone. Control Your Working Conditions. When your home is your workplace, the rules are whatever you want them to be. You can dress comfortably every day instead of having to wait for “Casual Friday.” There’s no one to stop you from eating or drinking in your office or putting your feet up on the furniture. You can choose to work standing up or lying down, or take frequent breaks to walk around and get your blood flowing. With some jobs, you can even take your work outside to enjoy a sunny day. Choose Your Clients. Admittedly, if you’re just starting out as a freelancer, you don’t have that much choice, because clients aren’t yet beating down your door. But if there’s someone you absolutely can’t stand to work with – a client who yells at you for no reason, or doesn’t pay what they owe, or wants you to do something that goes against your moral code – you can simply walk away. You don’t have to choose between putting up with the impossible client and giving up your job completely. Skip the Commute. This is one of my favorite perks. I don’t have to choose between driving to work, riding a bike, and taking the train – my daily commute is the six paces from the kitchen where I ate breakfast to my desk. This means that, in effect, I have a shorter workday, because I don’t need to tack on commuting time at the beginning and end. And since my kitchen is right down the hall, my lunch options aren’t limited to a restaurant or whatever I can pack in a brown bag. Ignore Office Politics. When you’re a freelancer, the petty little squabbles and power struggles that are part of any office leave you mostly untouched. Sure, you sometimes end up hearing about them from a client, and occasionally they affect the schedule or budget of one of your projects – but at least you don’t have to be right there in the middle of them day in and day out. Although the freelance lifestyle gives you more freedom, the flip side of that is uncertainty. When you’re a freelancer, everything about your job – who you work for, what you’re doing, how much you make, and even whether you have work at all – can change on almost a daily basis. Until you start working for yourself, you don’t realize how much you’ve become used to a set, comfortable routine. Uncertain Income. When you work for yourself, you don’t have a regular paycheck coming in. Pretty much every freelancer goes through dry spells with little work, or even no work at all – and if you don’t have savings or an emergency fund to fall back on, then no work means no money to pay your bills. However, even when you hold a steady job, there’s no such thing as absolute job security, since pretty much anyone can become a victim of downsizing. The main difference is that freelancers experience the ups and downs between having plenty of work and having no work more frequently. No Benefits. Most salaried jobs give you more than a paycheck – they also provide benefits, most notably health insurance. Thanks to the Affordable Care Act, freelance workers at least have a way to get health insurance on their own and can’t be denied coverage, even if they have preexisting conditions. However, they also have to pay the full premium themselves, while many nine-to-fivers have a big chunk of that cost covered by their employers. So making the transition from full-time to freelance means making a big adjustment to your budget. Extra Taxes. When you work for a regular employer, you and your employer split the cost of your Social Security and Medicare payroll taxes. As a freelancer, you’re on the hook for the whole amount: 15.3% right off the top of each paycheck for Social Security, and another 2.9% for Medicare. Moreover, since you no longer have your taxes deducted straight from your paycheck, you have to pay your estimated taxes four times a year in quarterly installments, instead of just “doing your taxes” once a year in April. And figuring out how much to pay isn’t always easy, since it’s based on the total amount you make over the course of the year – which is impossible to know for sure when the year’s not even half over. More Responsibility. When you work in an office, you can just come in every morning knowing there will be work for you to do – maybe not work you like, but at least you won’t have to hustle for it. By contrast, being your own boss means you’re responsible for every part of the work, from finding clients, to proposing projects, to figuring out a schedule and sticking to it. There’s no one to tell you what to do and when to do it – you’re completely on your own. Lack of Social Contact. One thing many freelancers say they miss about their old jobs is the casual daily chats with coworkers. When you work from home, it’s possible to go through the whole day without setting eyes on another human face. Of course, you can make more of an effort to see your friends during the evenings and weekends, or connect with others through social media – but it’s not quite the same as seeing familiar faces every day. To succeed as a freelancer, you need to be the kind of person for whom the benefits of extra freedom outweigh the drawbacks. This depends partly on your personality – people with an independent streak, who enjoy working on their own and don’t mind the extra responsibility, are more likely to be happy freelancing. It also depends partly on how well-equipped you are to deal with the financial drawbacks of freelancing: the uneven income, the lack of benefits, and the more complicated taxes. Being organized and able to plan ahead helps with this, as does having some money in reserve to help you through tough times. Skills. First and foremost, you need to have the skills and knowledge for the specific freelance job you’ve chosen. For instance, you can’t just decide to be a freelance web designer if you’ve never designed anything. In some cases, you can get this training from a client, but often you need to study or practice on your own to gain any skills you don’t already possess. Discipline. When you work from home, you have a lot more to distract your attention from your work than you do in an office. You have to be able to stay focused on the task at hand. You also need to be able to motivate yourself – to set your own goals and stick to them, even when you don’t have a boss looking over your shoulder asking where that report is. Assertiveness. Unless you’ve already made a name for yourself, you can’t just sit back and wait for freelance work to come to you. You have to seek out potential clients and then sell yourself to them. You also have to set your own pay rate and be firm about not accepting less than you’re worth. This is the part of freelancing that I dislike the most – though, fortunately, it gets easier with practice. Organization. As a freelancer, you’re in charge of every part of the job: planning your schedule, getting assignments done on time, sending out invoices, and pestering clients if you don’t get paid. You also have to organize your own finances: getting your quarterly taxes paid on time, and making a personal budget to deal with the uneven income freelancing provides. Succeeding as a freelancer means being able to keep a lot of balls in the air. A Financial Cushion. Since even the most skilled freelancer goes through dry patches with no income, you shouldn’t embark on a freelance career without money in the bank. Kiplinger recommends setting aside enough to pay all your living expenses, including healthcare, for six months to a year. However, if you have a spouse or partner who’s working full-time, you can get by with less. One reason I was able to leave my job for freelance work when I did was that I’d just become engaged to be married, so I knew my household would have at least one steady income, as well as a source of health insurance. A Thick Skin. Kate Hamill of Freelancers Union, a support group for freelance workers, warns that freelancers often have to deal with disparaging remarks from family or friends about not having a “real job.” It’s easy to find yourself feeling inferior compared to full-time workers with hefty paychecks – or to other freelancers who seem to be a lot more successful than you. To make it in the freelance world, you need the courage to keep doing what you want to do, on your own terms, without worrying about anyone else. As long as you’re happy with your work and can manage just fine on the amount you’re earning, that’s what matters. Some of the qualities you need to succeed in the freelance world are inherent to you: either abilities you’re born with, or skills that you can learn. However, there are also tools you can use to make every aspect of the freelance life easier. Some help you with the job itself, while others help you deal with the uneven income that goes with freelance work. One good general source of information is Freelancers Union. It’s free to join, and its website provides tools for finding insurance, setting up a retirement plan, and creating contracts. On its blog, articles cover all kinds of freelance-related topics, including finding clients, figuring out what to charge, organizing your time, and avoiding burnout. For the past couple of years, I’ve filed my annual tax return with an online software program called TaxACT, and it’s made the process a lot quicker and easier than filling out the forms by hand. If you’re comfortable doing your own taxes, TaxACT might be a good option for you. People with business income need to use the Premium plan, which costs $20 for the federal return plus an extra fee for each state return. TaxACT does not offer any help with calculating and filing quarterly estimated taxes, but Intuit QuickBooks Self-Employed provides it for $16.99 a month. After you finish a freelance assignment, you need to send your client an invoice for the amount owed to you. With many of my clients, I’ve just typed up a simple document in Word and sent it by email. However, more recently I’ve been using a free site called Wave, which lets you create and send out invoices online, keeps track of payments for you, and provides other accounting tools for small businesses, such as payroll and sales tax reports. Many other accounting software programs, such as Kashoo and Freshbooks, have canceled their free editions, but Invoicera still has a very basic one. Another option is the open-source GnuCash. As a freelancer, you’re essentially running your own business, and these days, a business needs a website to be taken seriously. I set up a very basic one with the free edition of WebStarts, a website builder that’s quite simple and intuitive to use. Some other free website builders that get good recommendations are Wix, Weebly, and WordPress.com, the most powerful of the lot – but also the most difficult to use. If you can’t get health insurance through your spouse’s job, then your best resource is your state’s health exchange, which you can find through Healthcare.gov. In general, you can only sign up for insurance during the open enrollment period; however, if you’ve just been through a life change that affects your coverage, such as losing your employer-based insurance, you can sign up at other times. Because freelance income tends to be spotty, it’s important to have a good budget. That way you can save your extra money when times are good and use those savings to get through dry spells. I use an Excel spreadsheet to keep track of my household expenses, but you can also use a personal budgeting program, such as Mint, to do most of the work for you. Saving for retirement is just as important when you’re self-employed as it is for everyone else. As a freelancer, you don’t have access to a 401k plan with matching funds from your employer, but you can still choose from a variety of retirement plans that you fund yourself. I use a traditional individual retirement account (IRA); other options include the Roth IRA, the SEP IRA, and the solo 401k. Working from home as a freelancer isn’t an idyllic or trouble-free life, by any means. Nonetheless, many people who have tried it – including me – would never want to go back to a full-time job. Despite the uncertainties of freelance work, the freedom to work exactly when, where, and how you want can be well worth it. If you’re uncertain about taking the plunge into freelancing, you don’t have to do it all at once. Instead, try taking a few freelance gigs on the side while still holding on to your full-time job. That will give you a chance to build up your freelance resume, garner a pool of clients, and work out important details, such as what to charge and how much time to allow for each project. And most of all, it will let you experience the freelance life firsthand and decide whether it’s for you. If you had the choice, would you leave your job to do freelance work from home?